Published: Sept. 9, 2018 at 02:44 p.m.
New Orleans Saints running back Mike Gillislee looses the ball on a tackle, and Tampa Bay Buccaneers safety Justin Evans recovers the ball for a touchdown. Published: Aug. 26, 2017 at 08:34 p.m.
Tampa Bay Buccaneers cornerback Vernon Hargreaves picks off tipped DeShone Kizer pass. 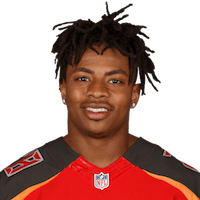 Published: Aug. 11, 2017 at 08:09 p.m.
Tampa Bay Buccaneers cornerback Vernon Hargreaves picks off Bengals quarterback Andy Dalton at the 1 yard line. Published: Dec. 11, 2016 at 05:14 p.m.
Tampa Bay Buccaneers cornerback Vernon Hargreaves intercepts New Orleans quarterback Drew Brees after the ball was tipped.